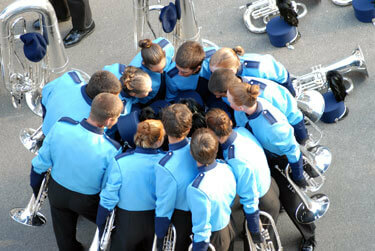 Thanksgiving weekend marks the unofficial start of the 2007 drum corps season. As students get ready to leave campus for the extended holiday break, many will start on their way to the first auditions for Drum Corps International groups. Whether you're on the fence about coming out to a corps' audition, looking for an edge to help you earn a spot in a coveted corps, or just a returning member interested in what other corps look for in their auditions, DCI.org has asked directors and staff members for their tips to help you on your way to becoming a member of the world's most elite and exclusive marching music ensembles. Good luck! Spirit from JSU; Aug. 10, 2006; Madison, Wis.
We look for potential. Performers come from a variety of backgrounds and training. Auditions are a time to see how a potential member would fit into a particular group's ensemble. Communication skills are essential. Even though you might not be executing perfectly, communication skills can bring your true potential forward. - Scott Chandler, Blue Devils program coordinator/choreographer Check out a list of audition dates for the corps you want to join.